After developing and building some V8 projects to help some friends, the mechanical engineer Amadeu Ferreira Junior decided to build a V8 motorcycle by himself with a revolutionary concept of four wheels called Cosmos 4RWF. He notes the potential success of his creation and that the international national market does not currently offer this kind of product to specific people who would like a high powered four wheel cycle machine, so he decided to build exclusive creations that are requested by others. 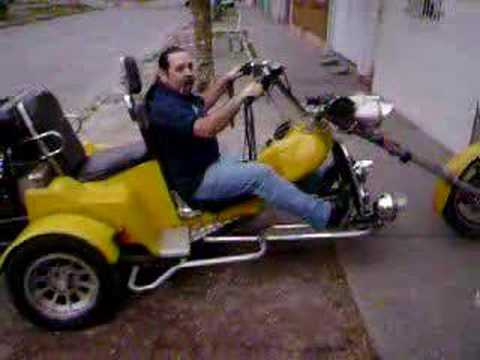 Cosmos Muscle Bikes Brazil is a company made to address this market, to satisfy the V8 Bikes enthusiasts demands. These products consist of of high powered motorcycles, using V8 engine 5700cc 350hp. The company has adopted a policy of limited production to offer a more exclusive product to clients. The company possesses technology developed to follow international standards of quality and security. They are comfortable and their dimensions are custom built for individuals physical characteristics. Each motorcycle will come with a number to uniquely identify with the owner of record of the motorcycle. The special projects are developed to suit customer requirements for larger sized motorcycles such as V8 trikes. The motorcycle is planned especially for the demanding enthusiast discerning customer. The motorcycles are high powered, conceived with high standards of trustworthiness and quality. The Cosmos Muscle Bike balances between a classic style and futuristic style. Manufactured with three main qualities: Beauty, Robustness and Technology. 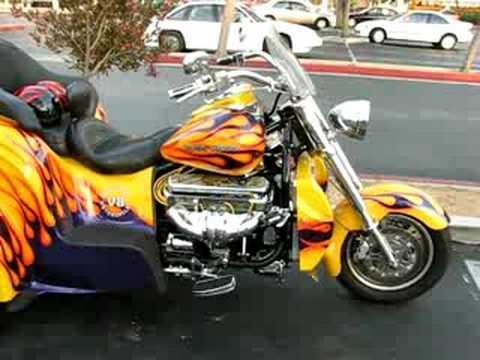 The bikes are made to order using a Corvette engine 5700cc 350hp. All bikes will have a number and the owner will have their name correspond to the number on the bike. Custom built bikes will take approximately six months to completion. Customers will have the right to visit the Cosmos Muscle Bikes one time every fifteen days. The waiting period will be listed in the purchase agreement with the date of the customer’s deposit. The first customer to make a deposit will take priority. First come, first served. All orders should be accompanied by the measures of the customer, including the height, weight, length of arms and the legs and shoe size. A limited number of ninety-nine 2RWF V8 and forty-nine 4RWF V8 will be made. There will be no number 13 number. The bike 4RWF, uses the COSMOS system to make curves, developed by Engineer Amadeu Ferreira Júnior. The system functions with two independent front wheels one of the other and if they move together for the sides, up and down. In curves, the two arms together with the body slide laterally, while the two back wheels remain vertically. The wheels turn until 33º for each side, being able to make curves of short radius. In the curves in low speed only the wheels turn laterally and in high speed the wheels lie down as a normal motion. These machines are sold direct by vendor shop or internet representative. 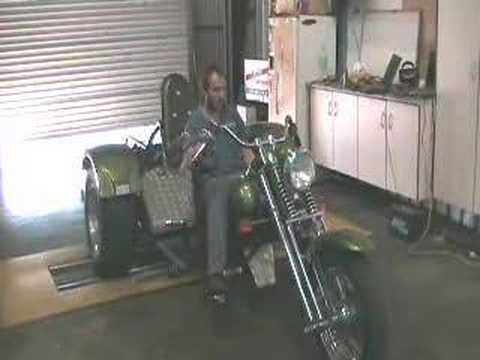 Boss Hoss is the leading manufacturer of V8 Engine bikes, and below on this page you can view the engineering prowess at work in these fabulous Boss Hoss videos. They provide the smoothest ride packed with the least vibration. 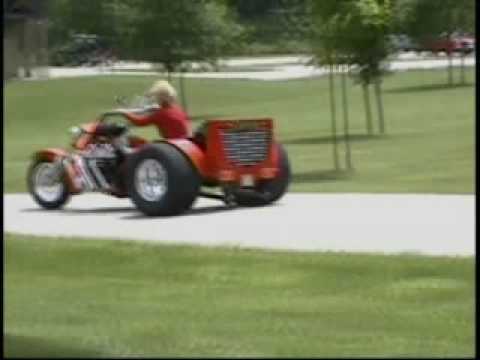 Boss Hoss produces bikes and trikes made with small block or big block V8 engines with semi automatic transmission with reverse functionality. They are a top flight maker of products which means they also sell large numbers of branded accessories and gear for their motorcycles and trikes. 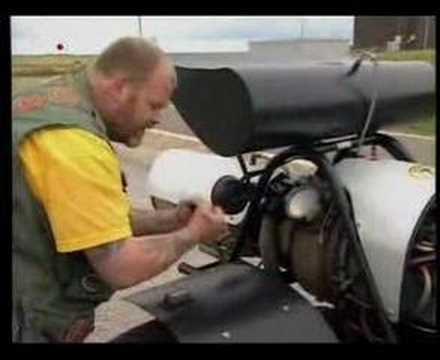 Even though they have a large car sized 8.5-US-gallon (32 l) gas tank, these Boss Hoss bikes only get motorcycle like distance out of a single tank of gas, due to the 25 mpg-US (0.094 L/km) maximum gas mileage for the small block and 18 mpg-US (0.13 L/km) maximum gas mileage for the big block.